As a team, Project: AK-47 has always highly valued collaboration with other organizations (both secular and faith-based) who are working to reach child soldiers. One of these organizations - Divine Inheritance - has been selected for a competition that could channel much needed funds into our joint venture projects in Mexico. If they win, Divine Inheritance (DI) will use the $50,000 grant to make our rehabilitation program sustainable for children and youth who have been caught in the crossfire of drug addiction and cartel violence. This project will literally be the last chance for many of these kids. Click on the picture above to find yourself on Divine Inheritance's page of the competition and click the "Vote" button. You get one vote for visiting the page without doing anything else, but don't stop there! Click the "Register for More Votes!" link in the top right hand corner of the page to fill out a short form (below). It will then require you to confirm your profile by clicking on a link that has been sent to your email inbox. 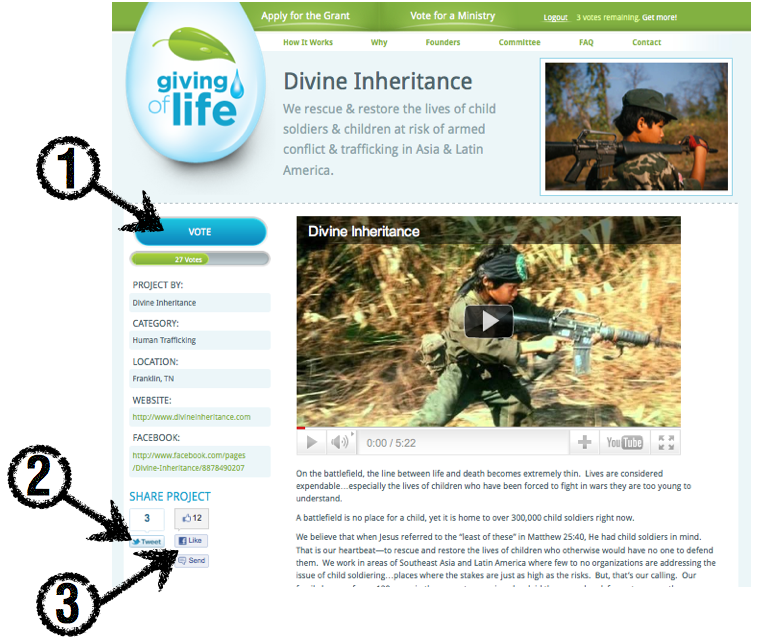 Once you're back on Divine Inheritance's page, click the "Vote" button on that page 3 more times. And presto...you've just helped us get that much closer to rescuing more kids--thank you!